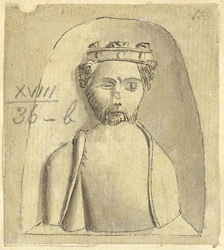 Drawing of a sculptured head at St Margaret's Church in Darenth in Kent. The church dates from the 10th century, making it one of the oldest parish churches in Kent. It has a remarkable Norman font. This sculptured head is likely to be from the font. Various figures are depicted including a crowned man holding a flabellum, who probably represents a king..